Our May pack walk this year will start from The Swan Inn in Newtown. We will walk up the road to Newtown Common/ The Plantation and have a wander round the woods before returning to the pub for a pint and/or a bite to eat! I have reserved an area for us so please let us know if you are planning on coming so I can give the pub a vague idea for how many of us to expect! Weather permitting we will be able to sit in their lovely garden. The walk will last around an hour/ an hour and a half, so those that don't wish to join us in the pub will be able to head off by around 12ish 😊. As always, the walk will be in aid of WECare Worldwide so please bring along some change for the donation box. In May we will be running a canine first aid course alongside Dog First Aid West Berkshire and Hampshire. 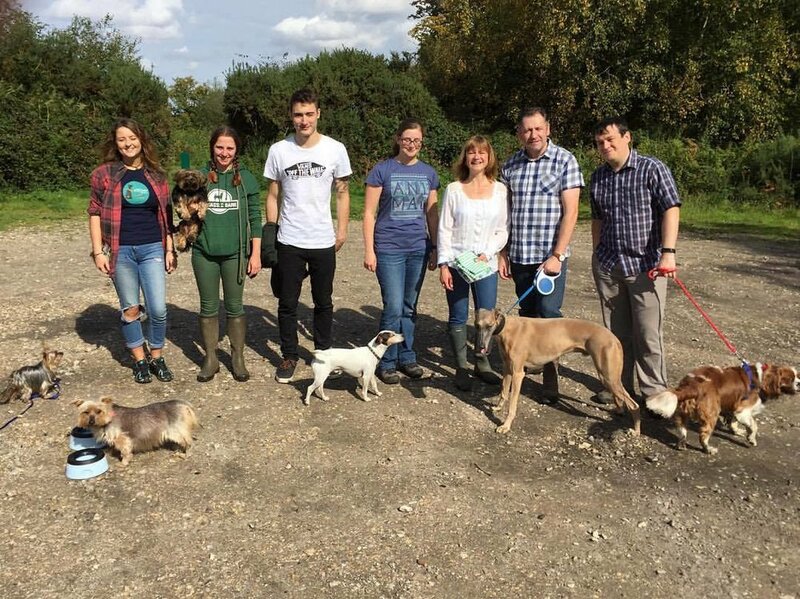 We completed the course last year and thought it was brilliant, and had a lot of great information that dog owners and dog professionals alike would really benefit from knowing in order to keep our dogs safe and healthy. The course will be running from 2pm to 6pm at Chieveley Village Hall. Please make sure you arrive promptly so we can begin on time. This is a Jurassic Bark CLIENT ONLY event. An opportunity for the dogosaurs to have a run around together in a safe, enclosed environment. Places are limited to smaller groups to make sure the day doesn’t descend into chaos, and the cost is £4 per dog. Please contact sophie@jurassicbarkdogs.co.uk to book. Unfortunately if your dogosaur is not walked by Jurassic Bark they will be unable to attend as we need to assess their play style and socialisation skills beforehand to ensure the dogosaur mixture for the session is a good match. If you have attended several pack walks and would like to join us, please get in touch as this may be a possibility 😊 . Our June walk this year will be round Headley Ford. Park at the top of Thornford Road, entering through Headley as the other side is gated off. We will then walk down the road and do the loop round the ford! As always the walk will be in aid of the wonderful charity WECare Worldwide so please bring along some money for the donation box. In August we will be returning to The Fox and Hounds in Theale as they have been so welcoming! Jayne, who runs the pub, will be joining us and taking us on a slightly longer route round Hosehill Lake, it should be about an hours walk, with an area reserved in the pub afterwards. Hopefully it'll be outdoors pub weather!! As always we will be raising money for WECare Worldwide so please bring some dosh along for their great cause. This April we will be hosting a dogosaur treasure hunt!! Entry will be a minimum donation of £5 per dog and all the money will be sent to WECare Worldwide - our wonderful charity doing brilliant work saving the dogs (and various other animals) of Sri Lanka. It will be a time based treasure hunt, with the fastest teams winning a prize. There will be prizes for 1st, 2nd & 3rd place. We will be kicking off the hunt at 1.15pm so make sure you are there by then if you want to get involved! Our March walk will be round Hosehill Lake in Theale, finishing up in the Fox and Hounds pub which is mega dog friendly! We finished our October 2018 walk here, and thought we'd return as they were wonderful. The walk will be different this time though, this time around the lake opposite the pub. The walk will be from 1pm-2pm, and we have an area booked in the pub for 2pm for those who fancy some lunch or just a pint post walk! As always the walk will be in support of WECare Worldwide and their great work, so make sure you bring some dosh for the pot! Weather permitting we will be walking round Greenham Common for our February walk. We will meet at the control tower car park, on the grass by the bench, next to the coffee shop. If the weather is rubbish we'll walk round the woods in Newtown instead as it’s less open! Bring the New Year in with a load of dog fun at our January pack walk! We will be walking round the woods in Bucklebury. Head down Holly Lane and you will see the Jurassic Bark van parked up on the left, and grab a spot nearby - no official car park but plenty of little spots for cars. Join us for a Christmas pack walk on 16th December. We'll be starting and finishing from The Bladebone which is in Chapel Row, near Upper Bucklebury. We have an area reserved, but to make sure everyone has a seat for a nice glass of post walk mulled wine, please make sure you let us know your’e coming, by either clicking attending on the Facebook event, or getting in touch. We will be leaving promptly at 2.30pm to ensure we are back in time for our 3.30pm reservation 😊. If you and your dogosaurs have Christmas jumpers, don't forget to put them on!! As always, the walk is in aid of WECare Worldwide so be sure to bring a donation for the tin. Weather permitting, our November walk will be around a few farmers fields in Chievely. It's very open so if the forecast is rubbish I may change it to somewhere a bit more covered! We will meet on Bardown which is a road off the high street. Our October pack walk will be starting from The Fox and Hounds pub in Theale, which has been rated Britain's most dog friendly pub!! So it seemed fitting as it's only about 20 minutes out of Newbury. We will take a walk along the canal, and then head back to the pub for a pint, and food if people would like. I have reserved an area, and it would be great if I could let the pub know how many of us are coming so they can make sure we all have somewhere to sit, so please please let me know if you are planning to come, or RSVP to the event on Facebook! As always, the walk is in aid of WECare Worldwide so please don't forget to bring a donation for their great work. As always, the walk will be in aid of WECare Worldwide so please don't forget to bring along a donation for their great cause. Our October pack walk will be starting from The Fox and Hounds pub in Theale, which has been rated Britain's most dog friendly pub!! So it seemed fitting as it's only about 20 minutes out of Newbury. We will take a walk along the canal, and then head back to the pub for a pint, and food if people would like. I have reserved an area, and it would be great if I could let the pub know how many of us are coming so they can make sure we all have somewhere to sit, so please please let me know if you are planning to come (or RSVP to the event on Facebook). Our August pack walk will start from Northcroft - we will meet on the grass next to the children's play area opposite the leisure centre. We did this walk back in May from the Lock Stock, but this way it will be a slightly shorter walk, still with plenty of swiming opportunities, in case it's still mega hot - hopefully it won't be hammering it down like it was when we tried it August last year! As always, the walk will be in aid of WECare Worldwide so please bring along some change for the donation box! Our next pack walk will be along Headley Ford. It's a footpath at the end of Thornford Road in Headley, but there is no parking specifically for the walk itself, so we will park at the top of the road and walk down. You should be able to find it using the postcode RG19 8AG (right next to Hope & Clay Construction)- you will need to come through Headley as the other end of the road is gated off. It's a really lovely walk with plenty of places for the dogs to have a splash. If you have any trouble finding it on the day give me a call on 07809908659 - I will park the van at the top of the road so just find somewhere near me, there should be enough room for everyone 😊. As always, the walk will be in aid of WECare Worldwide so don't forget to bring some change along for their great work! Our June pack walk will be starting and finishing at The Rowbarge pub which is just next to Midgham train station. It has a massive car park, and delicious food for anyone wanting a bit of lunch post walk. The walk is great and the pub are joining us in hosting the event as they do regular charity walks as well! We'll be meeting at 10.30am for some tea and coffee for those that want it, and then heading off at 11am for about an hours walk. As always, the walk will be in aid of WECare Worldwide so please bring some coins along for their great cause. Our May pack walk this year will be starting and finishing at the Lock Stock pub in Newbury town centre. We will walk along the canal, and do a loop to bring us back to Northcroft park, and back to the pub along the canal. The walk will likely take about an hour and a half and I have reserved an outside area for anyone that would like to stay and have a drink or a bite after the walk. As always, the walk is in aid of WECare Worldwide so please bring some pennies along for their great work helping the street dogs in Sri Lanka. In April we'll be walking around Wash Common. We will meet in Wash Common Park car park, which is at the end of Battle Road (RG14 6QU). We begin in a large park where the dogs can run around and play together, then walk through Skinner's Green and round some footpaths then back to the park! As always, the walk is in aid of WECare Worldwide so please bring along a donation for their great work. Our March pack walk will start from The Swan pub in Thatcham. We'll walk along the canal for a slightly longer walk, 1 hr 30/45 mins, then pop in for a drink, or some lunch if people like 😊. I have reserved a section of the bar for us and our dogosaurs! As always, our walks are in aid of WECare Worldwide so please bring some money along for their great cause. This month we’ll be going for a walk round the village of Burghclere. It’s a lovely area which I use a lot in the week for my walks! The lovely team at the Carpenters Arms have said we can park at their pub and then go in there with the doggies post walk for a drink, and some food if people fancy it! As always, the walk will be in aid of WECare Worldwide so bring along a few squids for the tin! Save the date for our August pack walk! Location TBC, we have a few options but any ideas welcomed as well. As always, the walk will be in aid of WECare Worldwide so make sure you bring along a few pennies for their great cause! Join us this July for our next pack walk! This time we'll be meeting at Northcroft park and heading for a nice local walk, with an opportunity for the dogosaurs to have a swim (not in the canal!!) It will be a 30 minute walk, then a bit of a splash, then a 30 minute walk back. 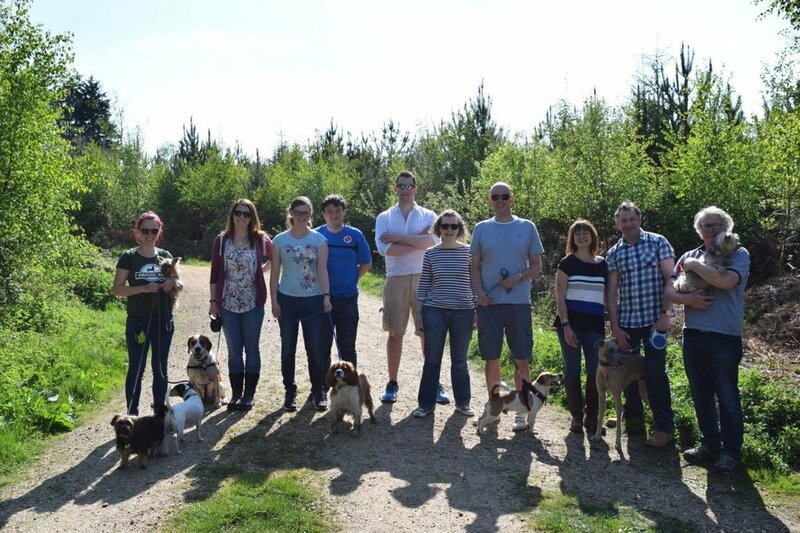 On the 3rd June we will be taking a walk around the beautiful Savernake Forest in Marlborough, followed by a dogosaur picnic where Oscar Pet Foods will be on hand with some delicious picnicy items for your dogs to enjoy. Our next pack walk will be around Penwood Forest. If you don't know the area, the best way to find it is making your way to Penwood Nurseries (RG20 9EW) and with that on your left, continue down that road and the car park is on the left hand side. It isn't a massive car park, but there are a few places along the road to park. Try to lift share if you can though, and I've made this walk slightly later to try and avoid the midday rush! As always the walk is free, though we will be taking donations for WECARE Worldwide for all their great work saving dogosaurs lives in Sri Lanka - so bring along a few pennies for their great cause! This Easter we will be hosting a hunt like none you have ever seen... especially for dogs! The plan is to hide brightly coloured plastic eggs, filled with dogosaur chocolates around the park. The team that collects the most eggs will win a prize! For this event we will keep dogs on leads during the hunt to reduce the chaos just a touch, with an opportunity to let them off to play afterwards for those that wish to. We will be taking donations for Dogs Trust on the day - so all we ask is that you bring a few pennies along to put in the donation box if you are taking part. Let me know if you are coming so I can make sure there are enough eggs to hunt for! 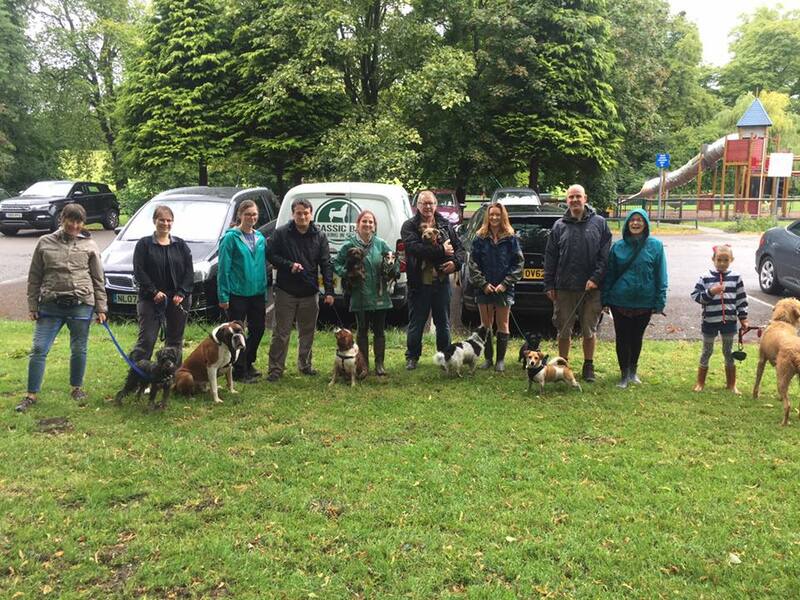 Our next pack walk will be at The Chase in Woolton Hill. This will be a slightly shorter walk than usual (c. 40 minutes), and dogs must be kept on lead through the forest, although we can let them off for a good play and run around after the walk in the off lead area. As always we will be collecting for Dogs Trust as part of the walk, so bring a few pennies along for the great work they do for our dogosaurs. Hope to see you there - if you are unfamiliar with the area the check here for directions. After the success of our Christmas Jumper Pack Walk, we are hosting another group walk at Snelsmore Common on the 4th of February in aid of Dogs Trust. It's free to come along, but we will gladly accept donations for Dogs Trust and the fabulous work they do. Bring your dogosaurs along for some company on their daily walk, and have a chat with other like minded dog lovers. If you're thinking about getting a dog walker, it'll be a great opportunity to meet me and my trusty team! 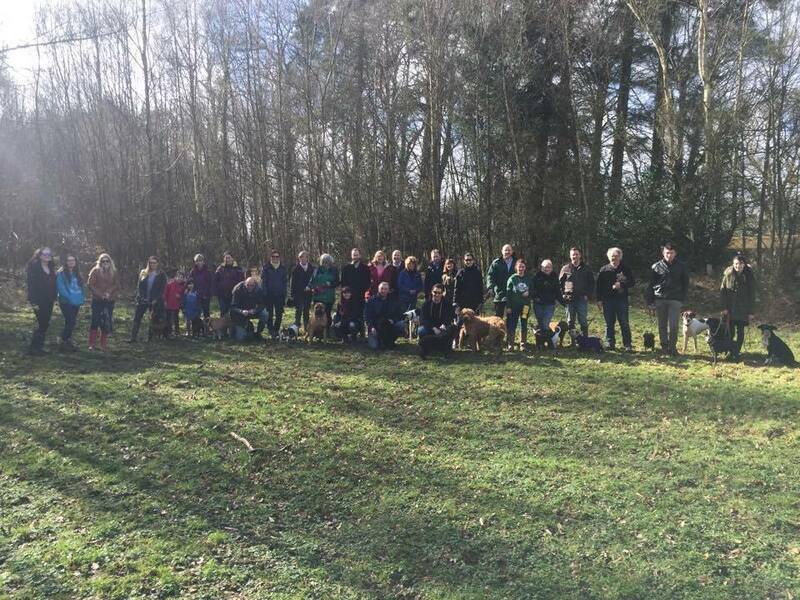 We hosted our first ever pack walk on 17th December 2016 and had a pretty good turnout -everyone enjoyed their goody bags and we managed to raise £23.01 for Dogs Trust! A few snaps from our past events. Want to be the first to know about our latest events? Sign up to our newsletter to keep up to date with all things dogosaur. We promise not to spam you with too many emails, and won't pass your information on to anyone else.